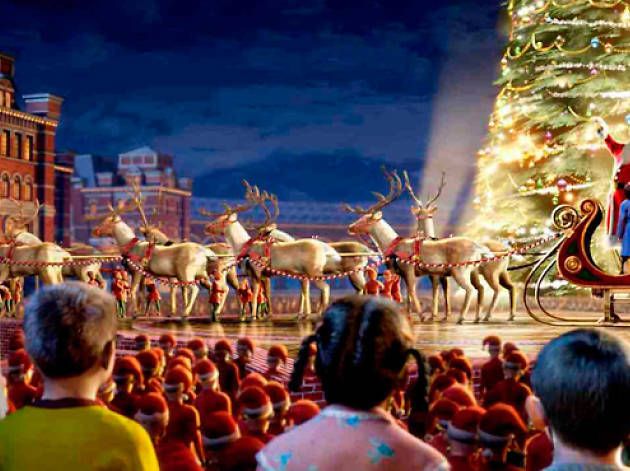 Make time to watch the best Christmas movies for kids! 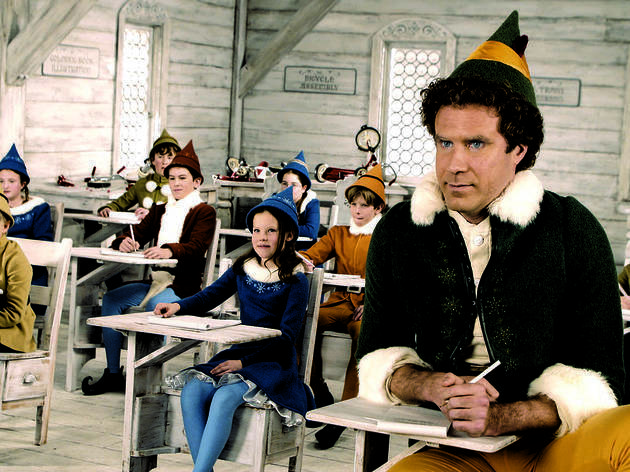 'Tis the season for classics like Home Alone and Miracle on 34th St, among newer favorites like The Polar Express and Elf. 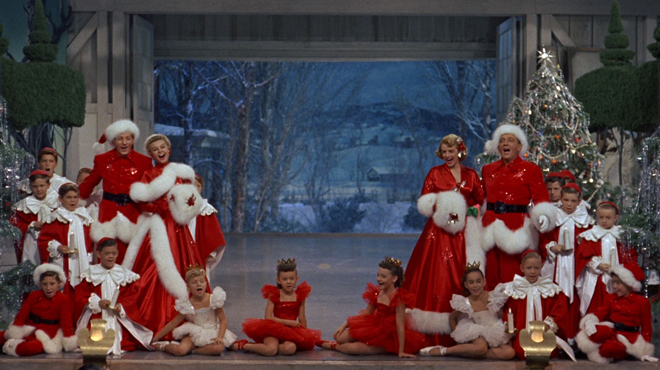 Why not plan a family movie night, make some hot chocolate and cuddle in for a Christmas movie marathon? If you're looking for even more holiday cheer, check out the best Christmas-centric events happening in Chicago this season or peep specific things to do with the kiddos in December. 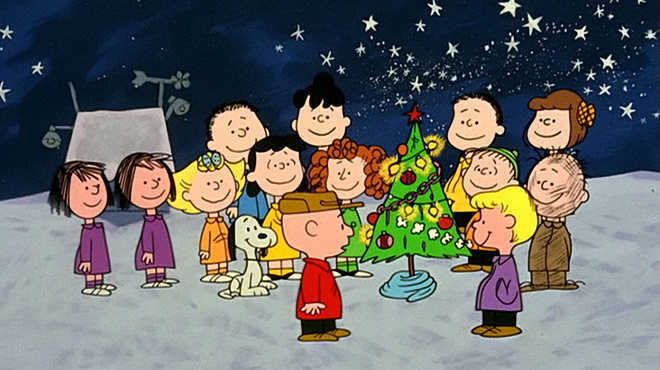 Even if Charlie Brown's Christmas tree is a little..uh...bleak, we can't help but spend our holidays with the Peanuts gang—it's tradition! 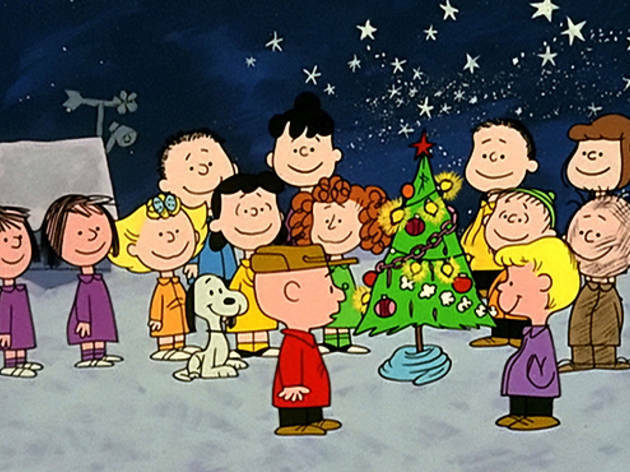 In this 60's classic, we find our favorite character, Charlie Brown, feeling a bit blue around Dec 25, and his efforts to conduct a festive play didn't exactly go as planned. It's up to Linus to show him what this time of year is truly all about! Snag the coziest spot on the couch and relive the fun from Charles Schulz's beloved cartoon. If you miss it, you'll certainly say, "Good grief!" 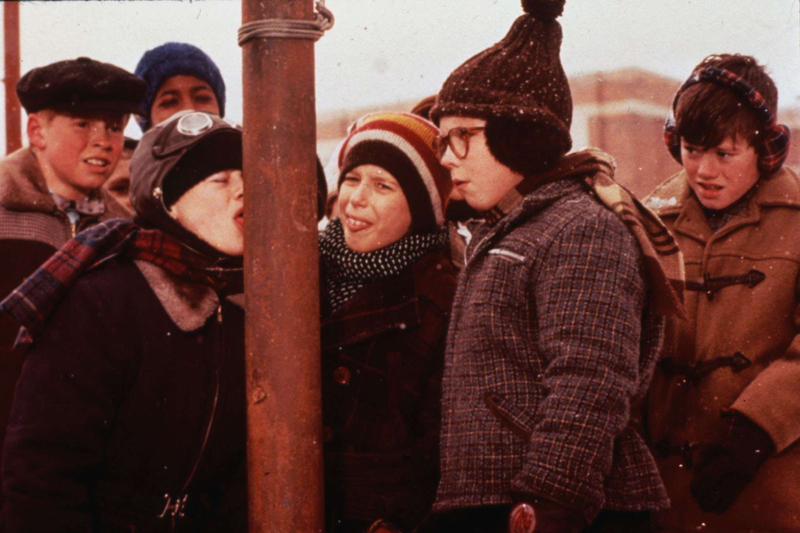 Rated G.
Get ready for one of our absolute favorite family Christmas movies of all time! 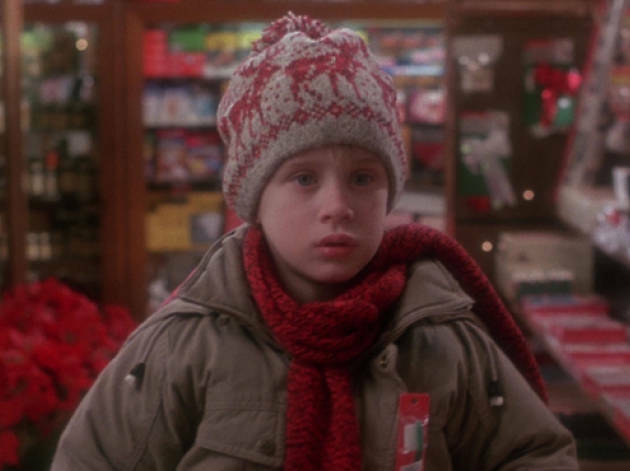 When the McCallister clan ventures on a holiday trip to Paris, it's smooth sailing...until everyone discovers that 8-year-old Kevin has been left home alone! The youngster gets comfy and adjusts very well to the empty house. Unfortunately, two buglars have their eyes on the family property. Will Kevin's wacky pranks keep the bad guys out? 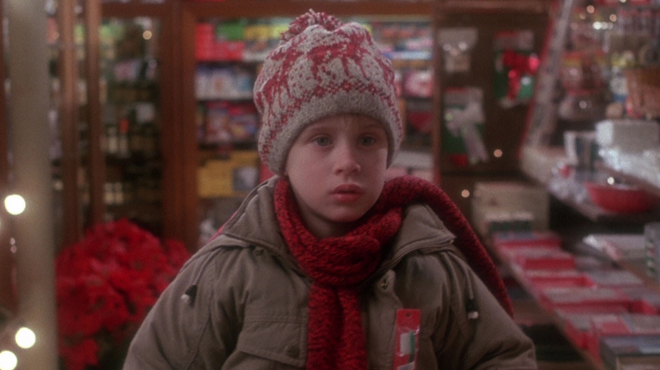 As the famous saying goes, "Merry Christmas, ya filthy animal." Rated PG. 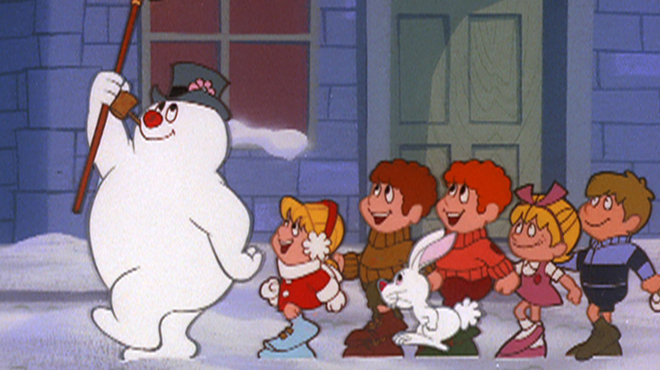 Poor Rudolph is given the cold shoulder for his appearance—a shiny, red nose. All the other reindeers laughed and called him names (sound familiar? ), ultimately making him a North Pole outcast. 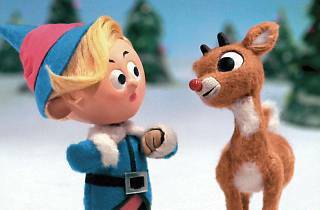 However, when Rudolph stumbles upon the Island of Misfit Toys—and when Santa needs a little help on one foggy Christmas Eve—suddenly, that glowing nose isn't so bad after all. The rest is history! 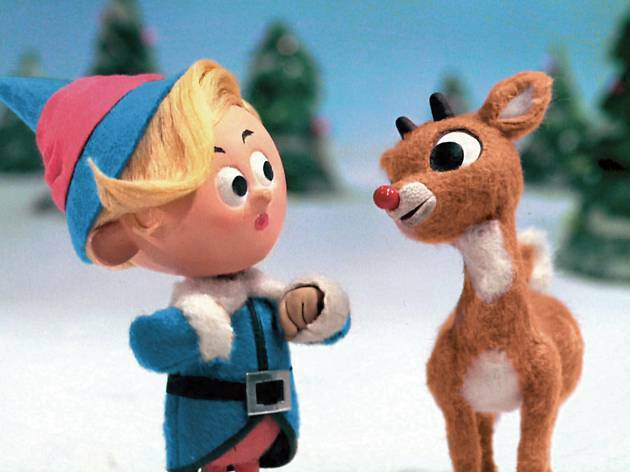 Thank goodness for you, Rudolph— Christmas Eve is a success because of you! 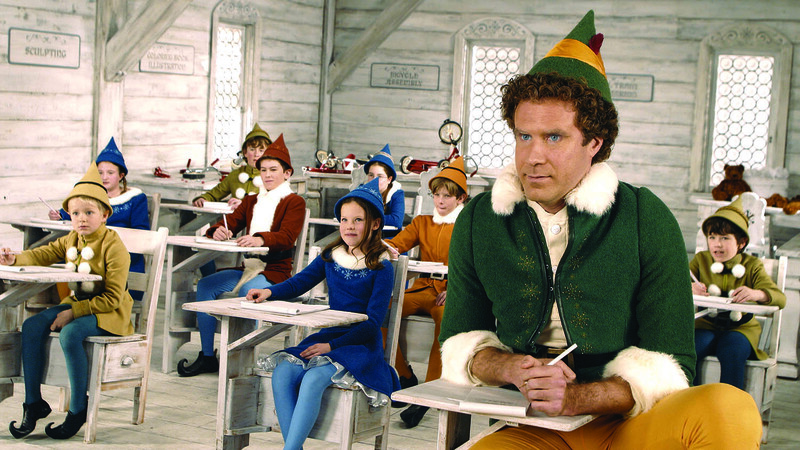 Rated TV-G.
New York City is a wonderful place to spend the holiday season...but it's a bit akward for Buddy the Elf. When Santa's helper learns that he's actually human—and outgrows the North Pole—he makes his way to Manhattan to be with his family. Will he be able to adjust to New York norms, or will he make his way back to Santa's workshop? One thing's for sure, as long as you sing Christmas cheer loud enough for all to hear, you'll be A-OK. (Also, make sure to stick to the four main food groups this holiday season—candy, candy canes, candy corns and syrup). Rated PG. 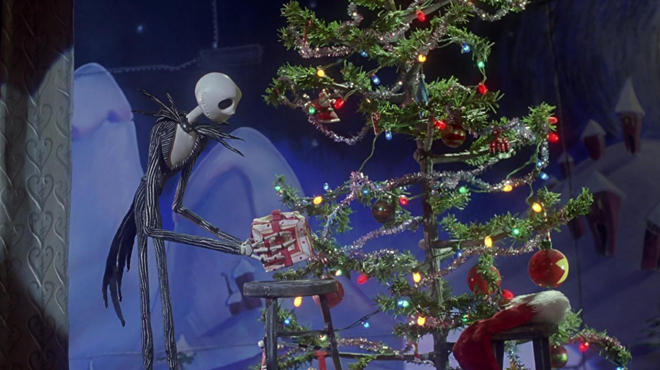 The great debate continues: Is The Nightmare Before Christmas a Halloween or Christmas movie? Since we'll never settle on an answer, it's best to watch this creepy Tim Burton classic several times between October and December...just to be safe. 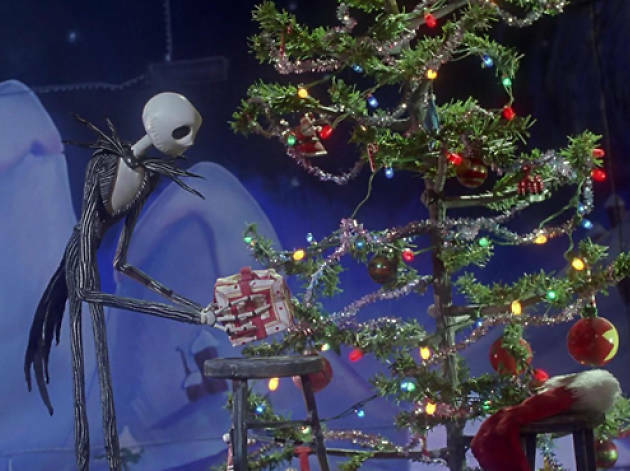 Journey alongside the Pumpkin King Jack Skellington as he grows tired of creepy festivities and soon discovers another holiday: Christmas. His new Yuletide appreciation causes a bit of a stir for the man in the red suit, so prepare for a bit of holiday chaos, plenty of tunes and Burton's signature spooky aesthetic. Rated PG. 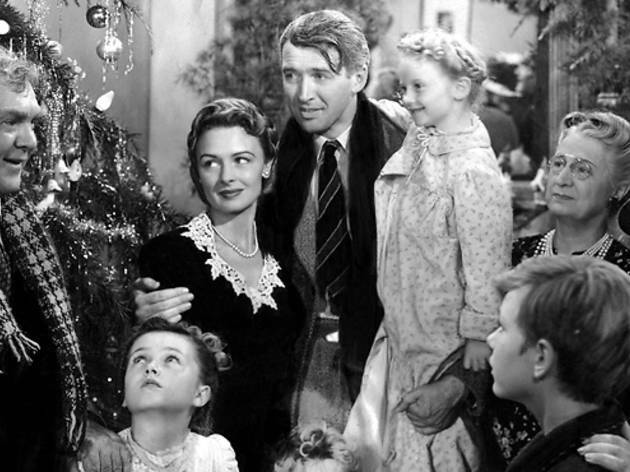 The reigning king of Christmas movies, Frank Capra’s poignant fable stars Jimmy Stewart as George Bailey, a man with big ambitions (and a bigger heart) who defers his dream of leaving small-town Bedford Falls, but makes personal sacrifices that create a staggering ripple effect of inspirational goodwill on earth—a great message for young viewers watching at home. He even helps an angel get his wings. Rated PG. 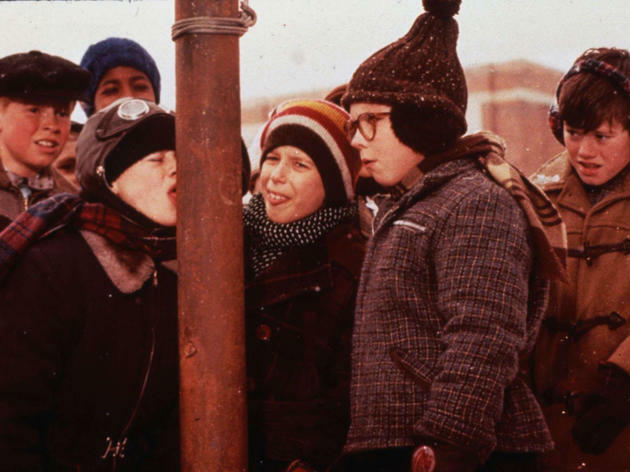 “You’ll shoot your eye out, kid!” All nine-year-old Ralphie wants is an official Red Ryder BB gun—and the only things standing in his way are a pink bunny suit, a leg lamp and a tongue sticking to a flagpole. Humorist Jean Shepherd’s short stories are the basis of this sassy sentimental brew. And who knew that duck was actually Chinese turkey? Rated PG. That small-hearted villain from Mt. 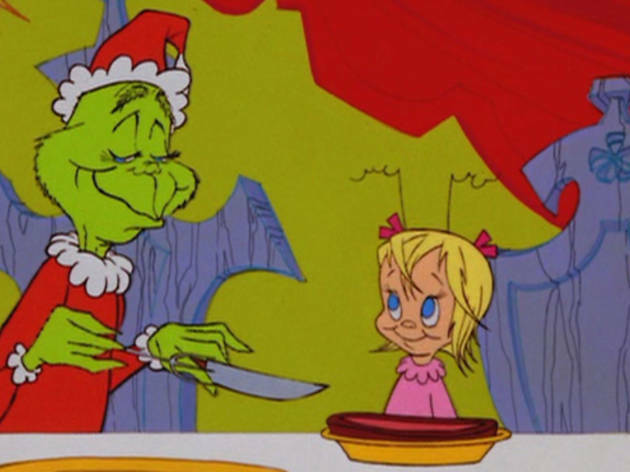 Crumpit goes down to Whoville for some seasonal spoiling—only to discover that Christmas cheer can never be stolen. 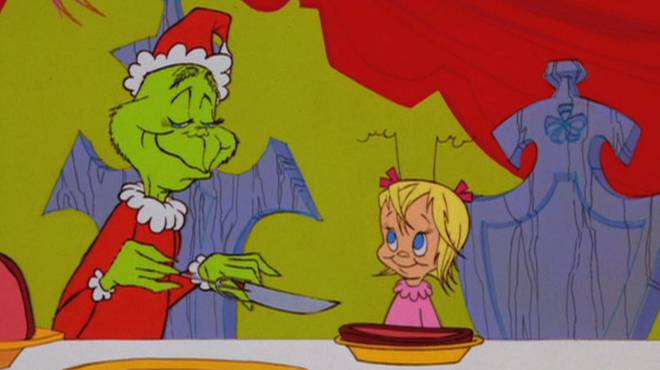 Spooky thespian Boris Karloff is the inspired narrator for this delightful TV special, a faithful rendition of the rhyming classic that will have everyone singing “Da hoo doray.” This fan-favorite family Christmas movie is not to be missed. Not rated. Ever since she was a girl, Elsa (Idina Menzel), princess of Arendelle, has had literally chilling powers. With a wave of her hand she can cover everything around her in ice and snow. However, when her frosty abilities nearly kill her sister, Anna (Kristen Bell), Elsa is confined to a room in her castle, not to emerge until she comes of age for her queenly coronation. On that day, unsurprisingly, things go very awry, and the two sisters—with help from a friendly snowman who dreams of spring—must work together to save the kingdom from eternal winter. 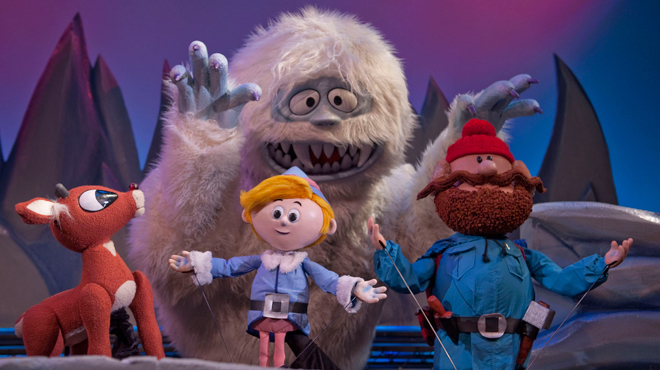 Plasticine CG animation brings the icy world to life in this Walt Disney musical production, which sparked a nationwide frenzy to scoop up any and all themed merchandise. 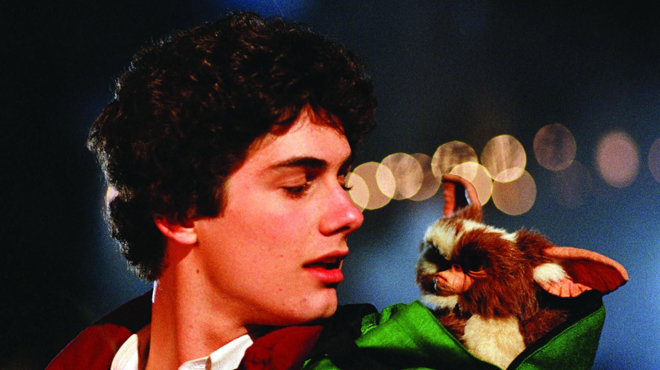 The almost instantaneous popularity speaks to the film’s success with the peanut gallery—not to mention countless parents who admittedly sang along to Menzel’s showstopping, self-actualizing ballad “Let It Go” more than a few times. Rated PG. 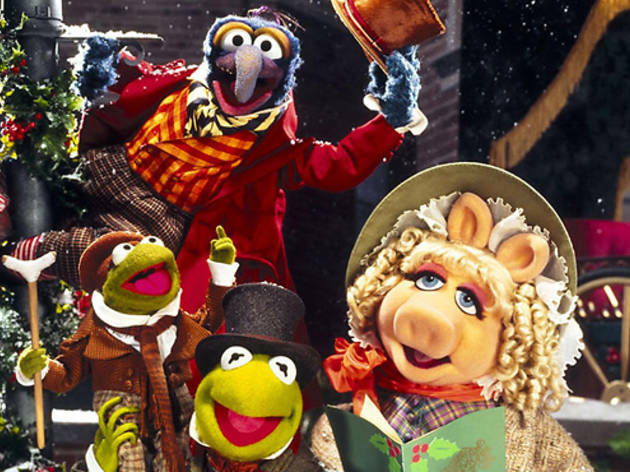 Second only to Muppet Treasure Island (sorry, we’re biased), Jim Henson’s The Muppet Christmas Carol retells the famous tale with characters like Kermit and Miss Piggy. 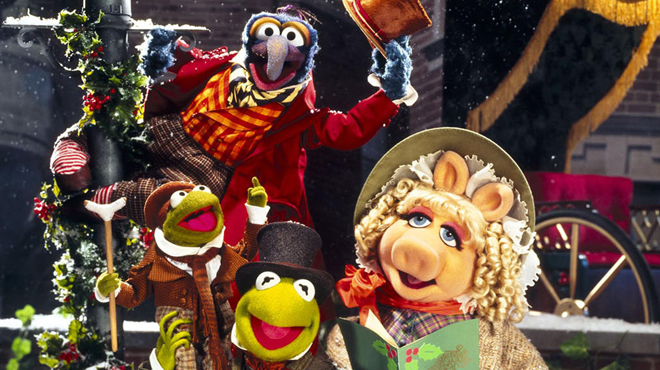 The musical—set in the Victorian era—features Michael Caine as Scrooge among puppets. Did we mention that Gonzo plays Charles Dickens? Rated G.
Chris Van Allsburg’s enchanting children’s book made its way to the big screen as an animated flick in 2004, drawing a new generation in for even more family fun. 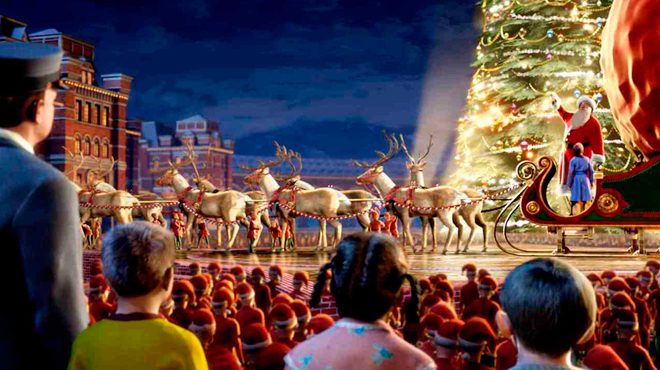 As the story goes, on Christmas Eve, a young boy finds a train parked outside his house—The Polar Express—which is headed to the North Pole! He finds out he’s been picked to receive the first gift of Christmas, and he asks for only one thing: a silver bell from Santa’s sleigh. But what happens when he tries to take the bell home with him? Rated G.
Is that bearded fella really Santa Claus? 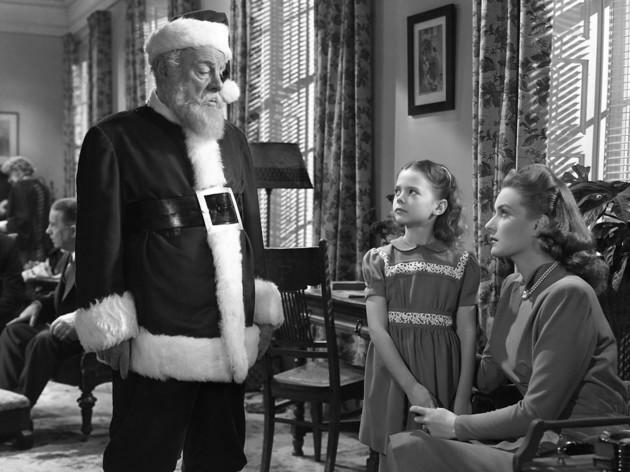 Macy’s hires gentle Kris Kringle to be its department store St. Nick, but his stellar commitment to the job (as well as insistence on being the genuine article) has all the kids in awe. Unfortunately for Kris, many considered his wonderful behavior and magical affect quite unusual—so unusual that he actually ends up at Bellevue! Will he be freed and his reputation redeemed? You’ll just have to watch to find out. Rated G.
This charming Vincente Minnelli musical features the director’s future wife Judy Garland as the restless daughter of a Missouri family during the 1904 World’s Fair. Not festive enough? Wait for the dramatic yuletide climax—along with the knockout debut of the holiday perennial “Have Yourself a Merry Little Christmas.” Not rated. 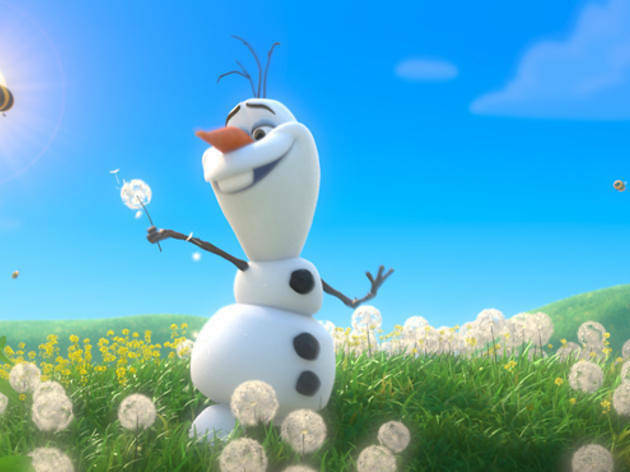 Ever wished your snowman would come alive? 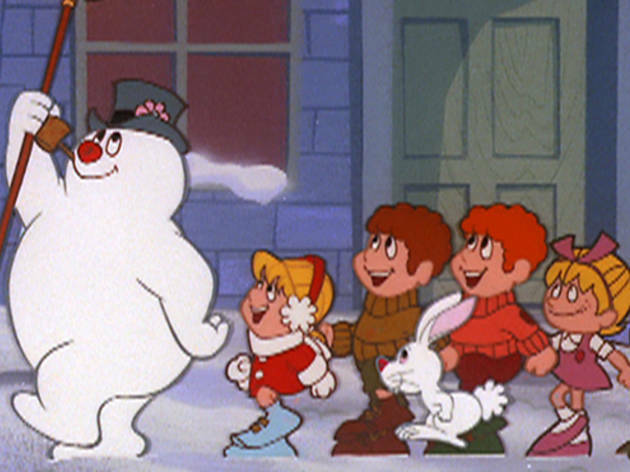 This 1950s classic—and its earworm hit song popularized by Gene Autry—tell the tale of a snowman doing just that! 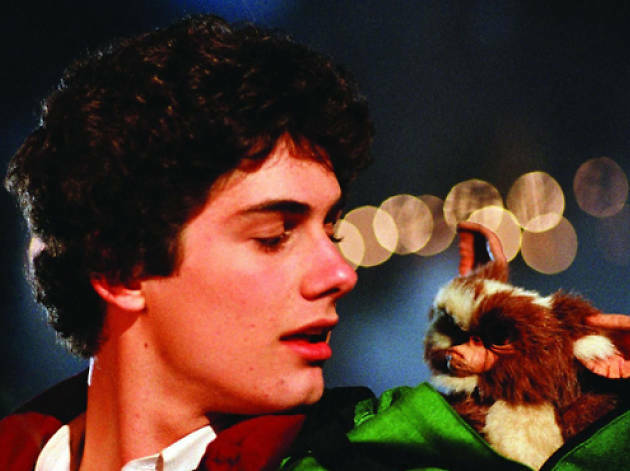 After children give him a magical silk hat discarded by a local magician, he becomes real and befriends a little girl that plots to keep him alive forever. 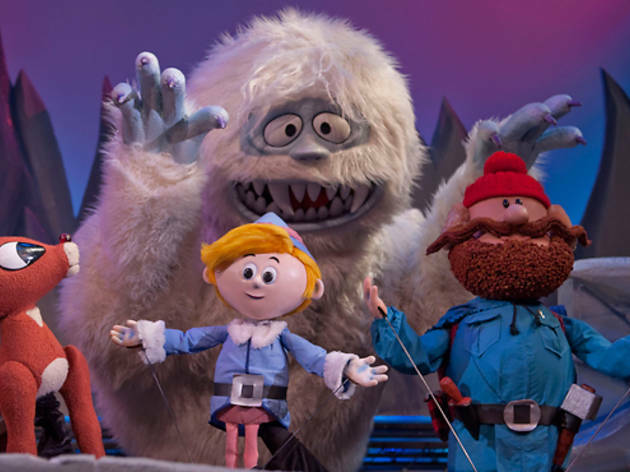 The two head to the North Pole in hopes that he’ll never melt, but it seems they’re not the only ones interested in the hat’s magical properties. Rated G.
Humbug! 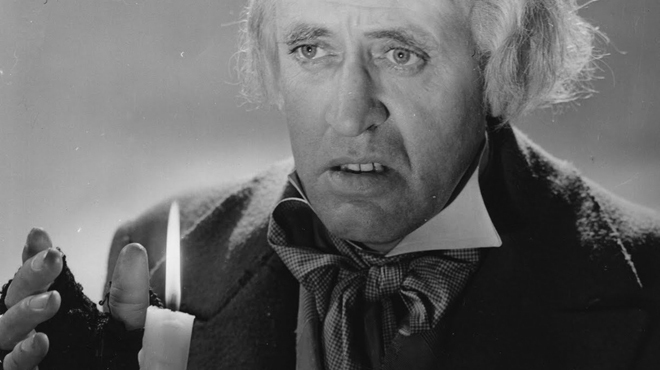 Deliciously malevolent Alastair Sim plays Ebenezer, the grouchy miser who endures various visions of Christmases Past, Present and Future in the world’s last-ditch effort to save him from being a true scrooge forever. 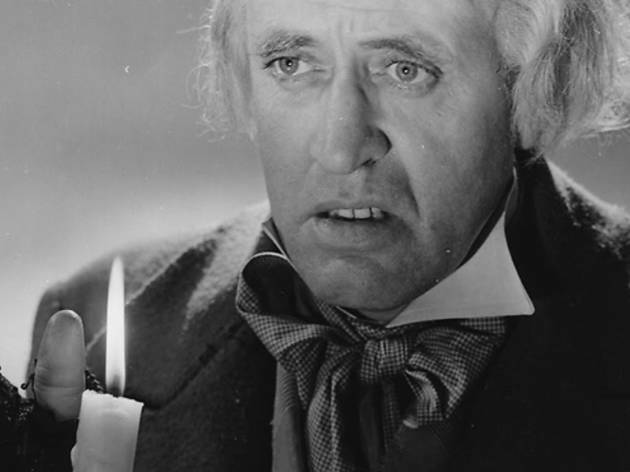 Will he give his faithful clerk Bob Cratchit the raise he deserves? Save Tiny Tim from a cruel fate? Treat his neighbors with any respect whatsoever? Learn to love Christmas? 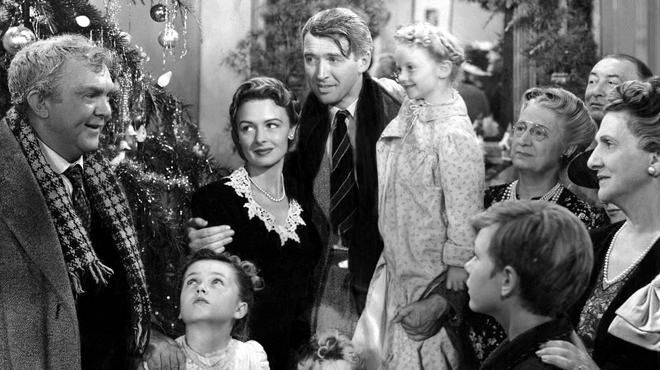 His marathon evening of soul-searching ends with a surprising decision, and while the film holds a rather dark plot, it’s ability to warm the hearts of all ages solidifies its role as one of the best holiday movies of all time. Not rated. This smart and very British 3D animation from the Aardman stable opens with one of life’s great questions: how does Santa visit so many homes so quickly? The answer, it seems, is a high-tech army of elves dispatched, SAS-style, from a silent spaceship disguised as a cluster of stars. 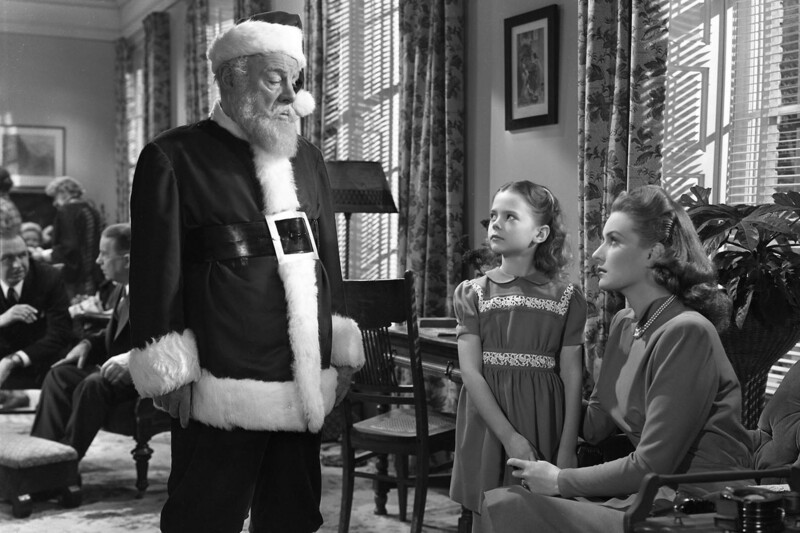 But it never used to be like this, not before Santa’s eldest son, Steve (Hugh Laurie), modernized the operation. Nevertheless, one parcel slips through the net, so it’s left to Santa’s sensitive younger son, Arthur (James McAvoy), and the retired, grumpy Grandsanta (Bill Nighy) to deliver the package using reindeer and sleigh. All of which inspires a frenzied inter-continental dash and one too many padded-out mishaps. What makes this festive fantasy engaging is the savvy way in which it debunks cold efficiency in favor of more wholesome values. Rated PG (via Time Out London/Derek Adams). 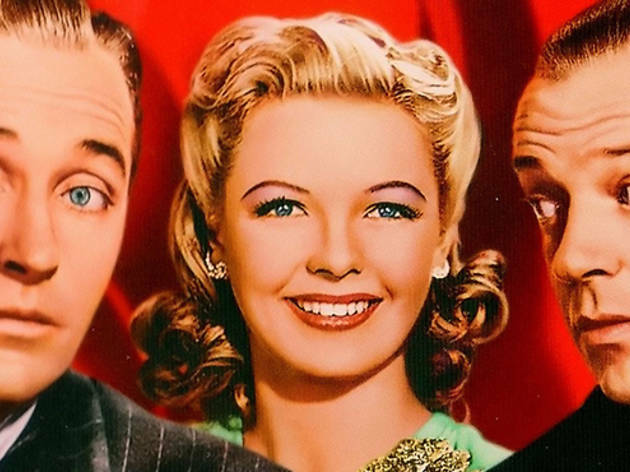 Swap Connecticut for Vermont, turn the entertainment troupers into former military troopers and slather on Technicolor sheen: You’ll be forgiven for thinking this Bing Crosby musical is just a toe-tapping variation on Holiday Inn. But it’s still a swell time, and no one should begrudge another cinematic victory lap for the juggernaut title song. Not rated. 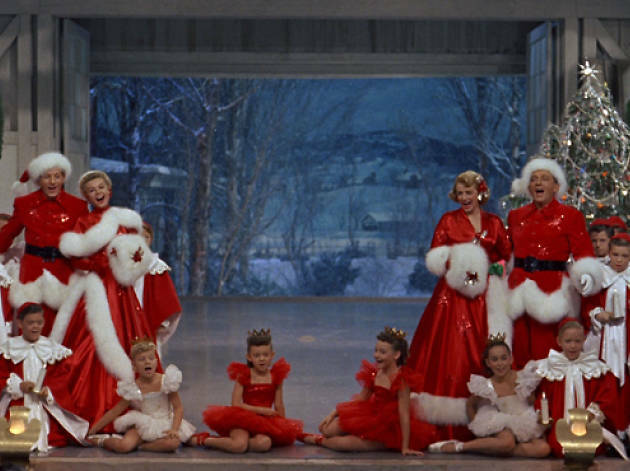 Families dreaming of a “White Christmas” are required to watch this delightful romp about star-crossed show people and a Connecticut resort. 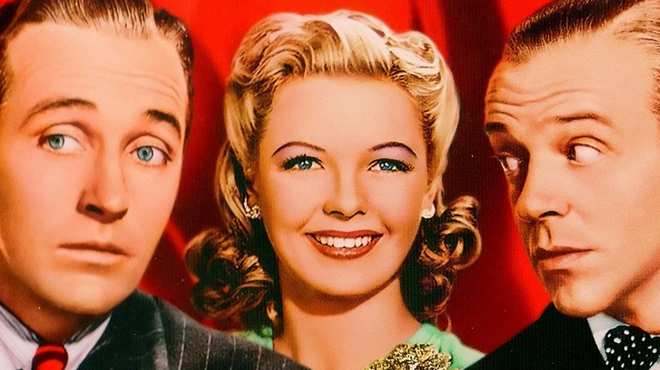 The comedy boasts a cavalcade of Irving Berlin songs that includes one of the biggest holiday standards of all time—and helped to make Bing Crosby the de facto voice of the yuletide season. Not rated. Disney characters like Mickey and Donald are snowed in at the House of Mouse at Christmastime, so Mickey saves the day and throws a Christmas party! When Donald still isn’t in the holiday spirit, Mickey finds a series of fun cartoons that demonstrate the meaning of Christmas, like “Mickey’s Christmas Carol,” “Donald on Ice” and “Pluto’s Christmas Tree.” Rated TV-G. Your favorite Nickelodeon 6 ¾-year-old piggy Olivia is back in action in this series of live episodes. You’ll follow Olivia as she wishes to become a Santa that returns lost toys (her favorite toy monkey Matilda is missing). You’ll also see her trying to make the perfect family Christmas in the middle of summer (complete with a snow machine). Above all, Olivia just wants everyone to have a great Christmas, and you’ll follow her on heartwarming adventures that your kids can really relate to. Not rated. George and The Man with the Yellow Hat are so excited for Christmas to arrive; they’ve busied themselves with fun activities like picking out a Christmas Tree and making a Christmas list, but they’re having a little bit of trouble figuring out what to get for each other. The Man with the Yellow Hat can’t really understand what George has asked for, and George has trouble making his gift for The Man with the Yellow Hat. Will they figure things out by Christmas morning? Not rated. A small-town teen gets an adorable furry creature as a Christmas gift. But there’s a catch: don’t get him wet—and don’t feed him after midnight. Those with a wicked sense of yuletide cheer will love the subversive anarchy of this Steven Spielberg production, a gleefully black lump of coal that’s equal parts fantasy and horror. Rated PG. 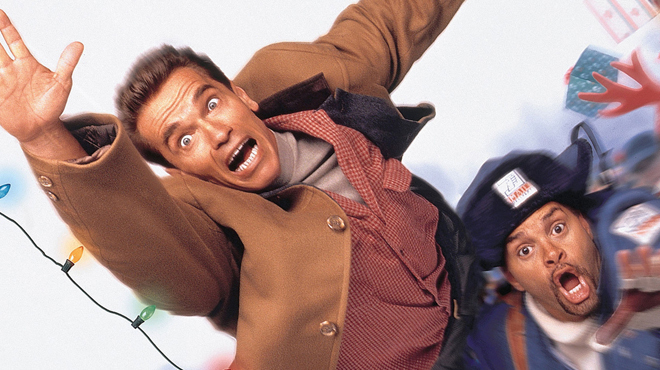 Arnold Schwarzenegger faces his most harrowing enemy yet: the holiday shopping crowd. 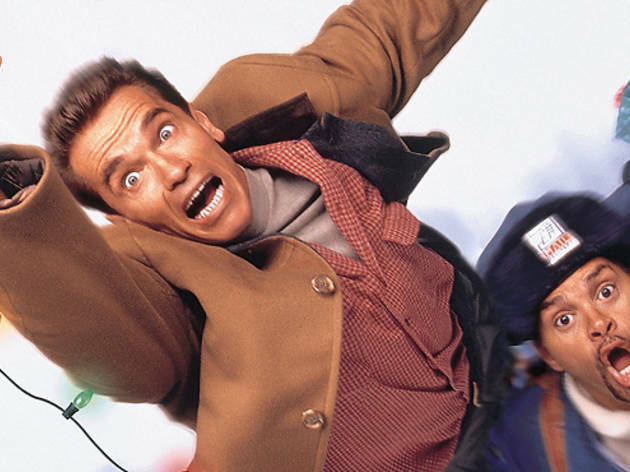 The Governator in his “family comedy” period is desperate to get the last remaining Turbo-Man action figure on Christmas Eve—even if it means fighting a Santa with candy-cane nunchucks. The contorted mix of action-hero hijinks and lowbrow jokes is just silly enough to make all the members of your family smile. Rated PG. What exactly happens when Santa's out of commission? One single dad finds out in this '90s flicks. While Scott Calvin (played by Tim Allen) reads his son The Night Before Christmas, he suddenly hears something on his roof. You guessed it—Santa! Scott has to fill in the holiday duties when Kris Kringle takes a tumble on the roof, and his son's mother and new husband aren't too keen on these holiday happenings. Rated PG.